Gerald’s father, Frank Judson Hildreth, left the family when Gerald was only about 2 ½ years old. His mother had to go to work to support the little family and was unable to take care of Gerald and his brother Bruce, so Gerald went to live with his grandfather, Charles Tobey, in Pony Hollow, New York. Bruce went to live with Mary’s older sister, Jane. Gerald saw his mother once every couple of months until he was old enough to attend junior high school when the boys moved back with her in Elmira. Gerald attended Southside High School, and according to his brother Bruce, he had hard time from the other kids in school, as well as adapting to the rigors of school. He grew up on a farm, attending a one room school house, so the transition was understandably difficult. 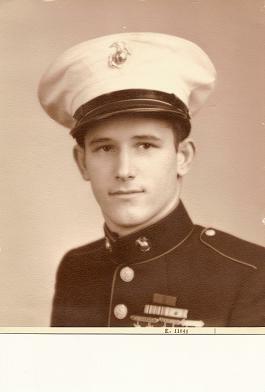 He left school and enlisted in the Marines at age 17 on 19 Nov 1940 at Syracuse, New York and was deployed to Marine Corps Recruit Depot at Parris Island, South Carolina. He fought in the 1st Marine Marine Division at Guadalcanal during World War II. This was an infantry division, landing on 7 Aug 1942. They no tents, spare clothing or bed rolls, no office equipment, unit muster rolls or pay clerks. Other things not yet available to this first wave of Marine deployments were insect repellent and mosquito netting. One can only imagine the conditions under which they fought and won the island. “Not a man was lost in the landing operation on Guadalcanal on August 7, 1942. The Japanese, caught completely by surprise, fled into the jungle and the hills beyond, abandoning their prized airstrip -- but not for long. When the fighting finally subsided on Feb. 9, 1943, more than 1,700 Americans had been killed, nearly 5,000 wounded (most of them, Marines) in this, the longest of the World War II battles fought in the Pacific. After they won the island, they were deployed to Australia to rest and regroup before the next deployment. We don’t know where else Gerald was deployed but since he didn’t leave the service for a few years, he may very well have fought with the division in the battle of New Guinea, the bloody battle of Pelelius, and finally Okinawa. He was discharged in November 1946. In Bruce’s letter to Gerald in September 1945, he asked about Gerald’s knee injury. Gerald was going back into the hospital evidently to try again to fix it. Based on Bruce’s letters to him, Gerald had struggled with malaria, as well, as so many of those Marines did that fought in the tropics. Gerald died in 1977 of a heart attack. My father lost his only sibling, and I was too young to realize what that must have meant, considering all the the trials they had gone through together. I hope they are together now. Wow, wow, wow! You know I'm going to be stalking your blog for more stories, right??? So glad to see this picture and info. The brothers sure looked a lot alike!